Your satisfaction is important to us. We stake our future on it, and have been doing so for more than 25 years. The excellent worldwide reputation that Kwik Kerb has developed, is the result of years of providing a unique, high quality product and making customers like you very happy. We appreciate the opportunity to enhance your landscaping and wish to make your Kwik Kerb® experience a pleasant one. 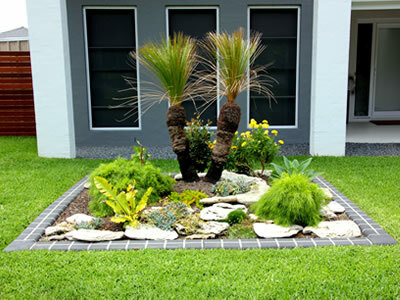 We trust you will recommend us to your friends and other visitors to your property. Please take note of the following and call us if you have any questions or concerns. We understand that you love your pets, but accidents can happen. Please ensure that they are safely locked away on the day that your Kwik Kerb® edging is to be installed. If part of the installation is to be in a high traffic area (such as a sidewalk etc.) it would also help to prepare a barricade of some kind to ensure people, children etc. don’t step on the freshly laid edging. Make sure your sprinkler system has been disabled. If you are aware of the location of any buried cables such as cable TV etc. please mark them so care can be taken to avoid damage when doing the preparation work. Please keep pets locked up at least until the day after installation. Keep the irrigation system disabled until two days after installation. It is a good idea not to undertake any type of activity around your new Kwik Kerb® edging such as digging, weed trimming or spraying, mowing or edging before the concrete has cured. This ensures that the Kwik Kerb edging attains maximum strength before being subjected to wear and tear. Concrete takes approximately 30 days to cure to full strength. Your Kwik Kerb® edging will have a very durable surface finish but it needs a certain amount of time to resist scratching and other damage. Please protect it for as long as you can. Once sealed upon installation completion, your Kwik Kerb® edging becomes immediately more resistant to light rain. Heavy rain within the first 6 hours after installation can cause damage. If the Kwik Kerb® installer hasn’t already covered the edging with plastic it would be an advantage to do so if a heavy rain storm is imminent. We have a proven system which includes taking many steps to prevent excessive cracks. We install control joints to allow the edging to crack in specific locations, which is necessary due to concrete expanding and contracting due to temperature changes. We will custom make the concrete using the latest technology to suit your particular conditions. Kwik Kerb® Operators are well trained and have vast experience and knowledge to support them, however, sometimes cracks can appear that are caused by conditions outside our control. Tree roots, vehicular traffic and subsidence or “wash-outs” of the ground can cause damage. Naturally we cannot be responsible for such damage which is outside our control. Many types of Kwik Kerb® Continuous Concrete Edging will be “sealed” upon completion with a special sealing solution. This product is specifically designed to help cure the concrete as well as protect the surface finish from sun damage and weathering. Depending on the edging location and weather conditions, this sealer may need to be re-applied every two years or so, to maintain the original beautiful appearance of your edging. Please call your Kwik Kerb operator for an estimate on the cost of doing this regularly if you do want to maintain the original shine and lustre forever. Certain lawn chemicals contain copper sulphate and other ingredients which can stain your edging. Please avoid spraying the Kwik Kerb® edging with chemicals. Mould or mildew sometimes appears on the surface of the concrete. It can be removed with a bleach solution and a small scrubbing brush. Rinse the edging thoroughly once clean. The sealer which has been applied will assist in the prevention of this problem. If necessary have the sealer re-applied after removal of mildew. All colored concrete fades to a degree. With lighter colors this effect is much less noticeable. The special process by which your Kwik Kerb® edging is created ensures the maximum amount of color pigment at the surface of the edging to ensure fading is minimized. (Methods used by other edging companies do not concentrate the color pigment at the surface in this way and severe fading can result.) Kwik Kerb® operators are very well trained, use a special sealing process and the finest natural and man made ingredients in the manufacture and installation of your edging. Any fading which occurs is natural and unavoidable. Periodical applications of sealer will protect your investment for many years to come. Efflorescence is a white powdery substance that sometimes forms on concrete during the first few weeks. It is caused by evaporation of water from the surface of the concrete which leaves behind the minerals (which were in suspension) as a salt deposit. It causes unsightly white stains which can be particularly objectionable on colored concrete. The correct application of sealer during installation minimizes the risk of this effect. If some efflorescence does occur you can remove it by washing with a weak acid solution (dilute pool acid at 1 part acid to 12 parts water). Make sure you rinse the edging with a garden hose after washing with this acid solution. Always use gloves and eye protection when using acid. You bought the best decorative edging in the world. These tips will help you to keep it that way!